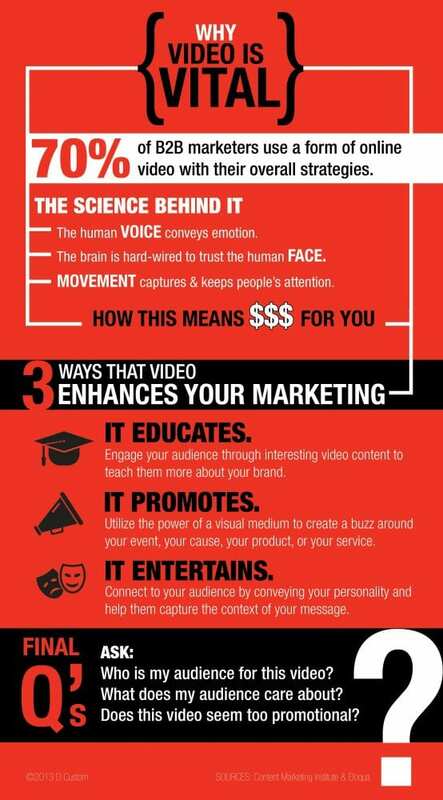 Video is vital. Any modern marketer knows that visual communication is the only way to reach a modern audience. From the calm voice narrating the experience to the movement of animated video entices an audience to pay attention. Video educates, promotes and entertains prospective users, but there are some issues to consider when making the case for video marketing. An overly promotional video will be shut down and ignored by audiences. But, you have to keep your target audience clearly in mind. The following infographic from Content Marketing Institute opens a rather productive Monday. As video marketers consider the tightrope act needed to grow audiences of consumers, they must keep the content flowing. While the information presented today is short, it’s focused in a manner to serve as a jumping off point for further video campaigns. The power of a visual medium comes from its ability to make the most of its brevity. Take today’s advice and find your audience’s needs today.